This is situated beside two houses on the A857. If you are coming from the North then it is on the right hand side. If from the south, then obviously on the left. The two bones that comprise the arch are the lower jaw bones of a Blue Whale and were removed from a beached Whale that came ashore in 1920. The harpoon that is shown in the picture was still in the Whale, however the explosive charge in the Harpoon’s head had failed to explode. Therefore, both Whale and Harpoon were intact. The Crofter that dealt with both Harpoon and Whale was lucky not have been injured when the Harpoon’s head finally exploded in his shed. Luckily he was not in the shed at the time. 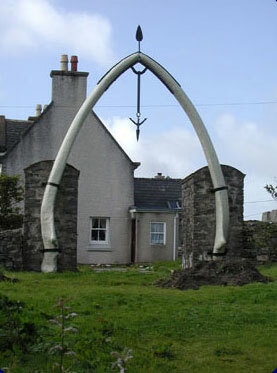 The magnificent Whalebone Arch now stands as a gateway in the garden of the two houses.